Often the highlight of the display season, this years Flying Legends airshow at Duxford, looked to be especially good. With one of the strongest line-ups in years already announced about a month before the show, not many people were expecting much more to be added. But just a few weeks before the show, the Fighter Collection announced that the sole airworthy Boeing P-26 Peashooter would be coming over from the show. This unique pre war monoplane is the flagship of the Planes of Fame museum, based in Chino, California. The P-26 was an important aeroplane for the United States Air Force. The first monoplane fighter in its service as well as the first production all metal fighter aircraft in the states. 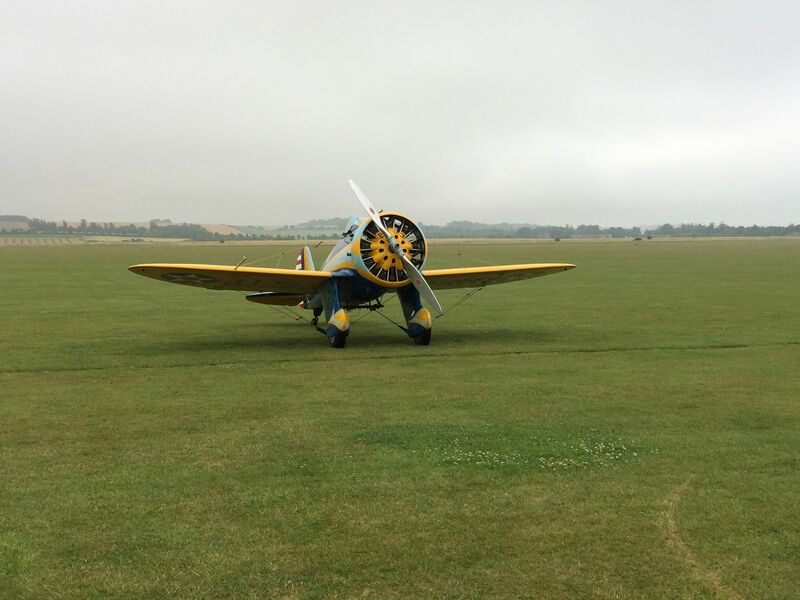 The aircraft looks typically 1920s, with smooth lines, bracing wires, a chrome propeller and an eye-catching, bright blue and yellow paint scheme. 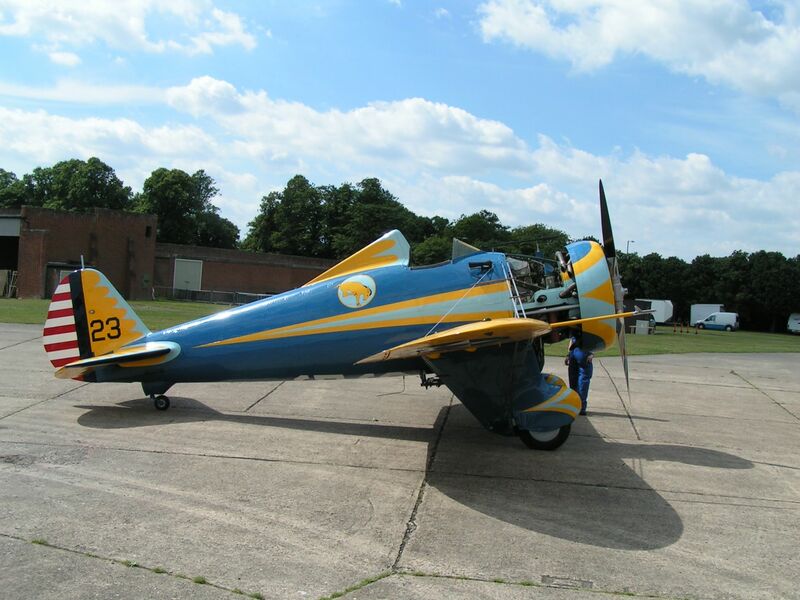 The Planes of Fame example is one of only two original P-26s left in the world. Having been a part of the collection for decades, it is rarely flown. Even since its rebuild in 2006, the aircraft is still only seen at the annual planes of fame airshow at Chino. So for The Fighter Collection to have secured it for the show was an incredible feat. Its appearance would also mark the first time a P-26 had ever been on British Soil at all, let alone flying. The only Peashooter to have spent any time in Europe was with the Spanish air force, a trial aircraft were sent to the Spanish Air Force. Ultimately the aircraft was shot down during the Spanish Civil War in 1937. Having seen photographs and videos of the aircraft over the years it has long been a hope of mine to see the machine fly. A container arrived at Duxford a week before the airshow and the tiny peashooter emerged, over the next week the aircraft was slowly put together, all the bracing wires were attached along with its chrome two-bladed propeller. I was there on the Wednesday before the show, expecting to see lots of arrivals and preparation for the weekend’s events. Sadly very high crosswinds meant that there was no flying at all throughout the day. Luckily all was not lost as Steve Hinton and his team pushed the little Peashooter out of the hangar and on to the airfield. It was only out for a taxi run, but it did allow us to take in the impressive starting sequence, where the starter motor is hand wound by the ground crew, shaking the aircraft side to side as the motor sirens round. Then there is a short pause before the propeller spins round and the engine fires into life, sounding like a cross between a Ryan PT-22 and T-6 Texan. It wasn’t until late on the Friday that Steve Hinton was finally able to get the P-26 into the air. 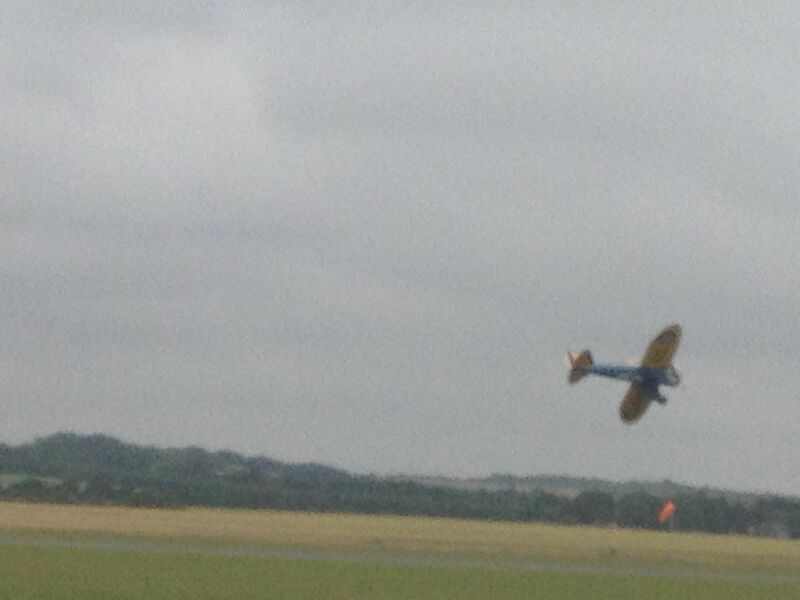 Steve took off in gloomy conditions and circled the airfield for a while before launching into a practice display. The initial practice seemed much lower than the weekend displays; it was a real thrill to watch this tiny American fighter speeding along at low level. Sadly the Peashooter only managed one performance over the weekend due to crosswinds on the Sunday. P-26 during its practice display on the Friday of the show. With so many other special moments and appearances this year it would be easy for the Peashooter’s visit to be forgotten, but it is worth remembering what a unique experience Flying Legends provided. I would like to thank both the Fighter Collection and Planes of Fame for bringing such a wonderful aeroplane over to display in this country. Certainly an aeroplane I doubt many expected to see in British skies.